stickboybike: Token T50 follow up. This past Monday, April 14 marked the first Monday Night Ride of the season. These rides have been rolling for 3 years, since the bike gig was launched. For our first night out we collected 19 cyclists aging in ranges from 18 to 64; novice riders to CAT3/2/1 racers. It's a great mix of cyclists and fortunately everyone's attitude was positive and welcoming to the new cyclists. The weather was super chilly...temps hovering around high 40s as the sun was setting halfway into the ride. I opted for a short sleeve base layer, l/s mid layer and a long sleeve Giordana jersey with knee warmers. My low body fat lends me to chills very quickly when pedaling and with this being a social pace, it's hard to keep the fire burning hot. I took out the Token T50s for a test ride that evening. Riding tubulars on a social ride isn't the brightest move but dang it, I was itching to get some miles under them. The 50mm carbon profile looks deep. I got tons of comments on the new hoops and many regarding how loud the freehub mechanism ratcheted. There is no way to sneak up on someone riding the T50s. The spoke profile is tucked in nicely at the hub flange. This spoke profile on the front and rear hubs yields a lower frontal area that is exposed to wind forces. In other words, this set up cheats the wind. Combined with the 50mm rim profile, this wheel set spools up like a turbo charger with 14lbs of boots. The T50s definitely make a slow guy like me feel fast. I have tons of miles on this bike that has become the test bed for the Token T50s. My previous wheel set are the Shimano 600 Ultegra hoops. Their weight is around 1620 grams. The Tokens are 1410g. Almost a half pound lighter and extremely noticable when stomping on the pedals on a climb. On the flats the wheels are very quick to change directions despite being large in profile. I experienced some obvious cross wind shaking but nothing that was too alarming. The top speed on the flats are easy to maintain low 30mph with out rising out of the saddle to keep things a boil. I would definitely run these on race day. Tubular tires are very smooth rolling corner to corner. 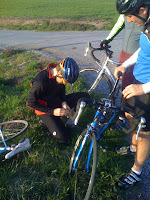 I luckily didn't flat on the ride and left my seat bag at home banking on not needing to fix anything or repair a flat. The one and only mechanical was a snapped 9spd chain. Keller was quick to help and had a quick link on him. Matt works in the shop and is a huge resource for old school bike tech/history and wheel building technician. Another ride in the can. Thanks to everyone that came out and we'll see you next Monday!